We have several of these and each one is distinctive. It makes it hard to sell them as we want to keep them and watch them grow to maturity. 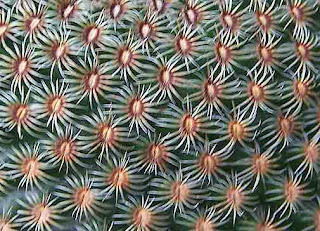 This is Astrophytum myriostigma 'Onzuka' and is of the form which is sometimes labeled 'quadricostatum', though the form doesn't always last into maturity, with an additional rib or ribs showing up late for the party. For those who are familiar with the weather here in the Pacific Northwest, it's not especially surprising that we are just now getting some real summer weather...or at least we're supposed to this weekend with temps into the 80s F. If you've lived here long enough you know that the unofficial beginning of summer is July 5. By then most of the moisture has been wrung out of the sky and we can expect about three months of dry, moderately warm weather with low humidity. I'm ready. Another nice small-growing Aloe hybrid, Aloe 'Latte'. This one's not bright and almost florescent, like some, but subdued and more subtle. However, I like my morning latte and this just doesn't remind me of my morning repast. To me it has more of the feel of chocolate, or perhaps mocha, but they didn't ask me. Getting back on topic, the following are photos of Echeveria 'Morning Light'. These are wonderful plants and I think Lynn-Marie caught the essence of these plants with these photos. These are certainly at the other end of the spectrum from E. 'Mauna Loa' and 'Etna' (which illustrate a different kind of beauty), but are just as impressive. Lynn-Marie is the artist in the family and she takes special care in growing these beauties. This is a wee bit off topic, but I can't help but share this about my high school alma mater, Roosevelt High School here in Portland. A few years ago they didn't even have a theatre group, but this year they made it all the way to the Thespian Festival in Lincoln, Nebraska. It's quite an honor for them. The review of the play they produced is located here. We got up this morning to discover an overwhelming, sweet aroma in the main greenhouse. Lynn-Marie had checked it out the night before with the flashlight but hadn't seen it. But this morning, there it was. 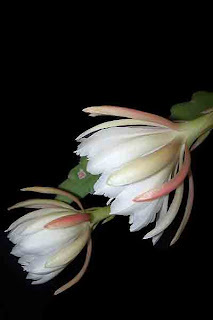 One of our Epiphyllum oxypetalum plants was blooming, the first such bloom of the season. I'm sure there will be more to come, but for now, what a way to begin the day. This also means I've got a job ahead of me finding places to hang them outside the greenhouses. I always put of this task until later than I should, but it gets done eventually. They do so much better outside under the trees at this time of year. There's a very nice time-lapse video of one of these flowers opening here. This is a nice small-growing hybrid Aloe with a complex ancestry. It's a hybrid of hybrids: (Aloe jucunda x Aloe descoingsii) x (Aloe parvula x Aloe boiteaui). It remains quite small but makes nice compact clumps. No photo from me tonight, but there's some nice pictures from the sale posted at the DangerGarden Blog . Check it out. You might even get a distant shot of me there. It was a lot of work but also a lot of fun. And the one in July should be even better. Plan for it now: July 15, 16 & 17 at the Portland nursery at 5050 SE Stark St. in Portland. Hope to see some of you there. 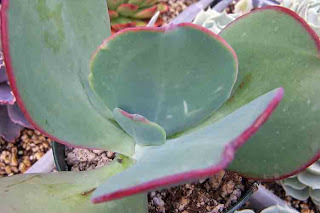 In the meantime, check out some of those other cactus & succulent blogs from around the world. I'll be adding more to my blog roll soon. When I first saw this plant many years ago I was immediately attracted to the amazing symmetry of the spination; it's a very striking plant. This is a close-up, of course. This isn't the first time I've posted this flower, and if it seems like I keep repeating myself, it's because it keeps flowering so often. It just hangs there above our kitchen sink (except when it goes outside as it will soon) and keeps on flowering and flowering. Tomorrow's the day when all these plants get packed off to the sale site, and this is just a very small sampling of the plants we'll be taking. We're not the only vendor. On Friday, when it all begins, I'll be at the site from 8 a.m. to 8 p.m., and also on Saturday. Then we get a short day on Sunday - 8 am to 5 pm - with me taking a break in late morning to officiate at my church, substituting for the pastor who will be out of town. While I was preparing plants for the sale this weekend I was again impressed by the variation in flower color with Mammillaria zeilmanniana. As an example, observe the following four plants I potted up today. They're all M. zeilmanniana, but what a difference. Some botanists now place this with in M. crinita, but when you've been around these plants for as many years as we have, it's kind of hard to change. A warm welcome to those of you who are new to the blog. In general, I keep the talk at a minimum and let the photos do their thing. But I welcome your comments and feedback. Once in a while, when I'm more awake, I may go into the background of a particular plant. But mainly, I hope you enjoy the images. Lynn-Marie (my wife) and I co-own a small succulent nursery and the blog is a part of that. But though we would love to have you check out our nursery, the purpose of the blog is not to sell plants but to increase interest in and enjoyment of these fascinating plants. Rebutia krainziana is cooperating for the sale this coming weekend. They're putting on quite the performance, and they should still be blooming this weekend. I know that many have reduced this to a variety or a subspecies but I don't even remember what species they placed it under. But, though I try to keep up, I don't claim to be a botanist or a taxonomist...just a grower of plants we've always been fascinated with. We've been holding back this Lithops plant for three years now. This is its third set of leaves and the variegation remains as it was in each previous set. We'll see what happens this year. Today was one continuous process of potting up plants. It'll be the same for the next three or four days until my grandson and I transport the plants to the sale site. We don't own a large truck, so it takes about 4 or 5 trips in our Ford Aerostar Minivan. They don't make the Aerostars any more, but it has several advantages, the most of which is that it has plenty of head room. We can even carry Ladybug (the mini horse) in the back! The coloration on these plants has been outstanding this year. Eventually they will grow to be very large, like the non-variegated species. But it's not especially cold hardy, taking temps down to the upper 20s F but objecting to anything lower. So...for warmth deprived areas such as ours, it makes a great larger pot specimen which is brought into cover during the cold of winter. Well worth the effort. 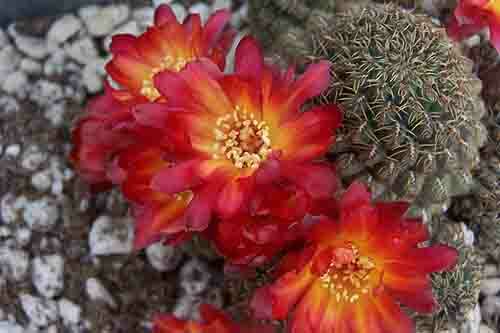 Too tired to write much, but had to share this pic of a tray of Rebutia perplexa flowering. Enjoy. Flowers popping out all over. 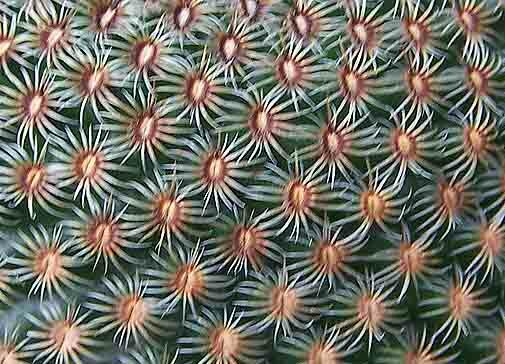 This is Mammillaria mystax. It's hard to keep up with all the flowers at this time of the year. It's also one of the nicest times of the year around our humble abode. But does it ever keep us busy. We received this plant many years ago, simply named "Large White". Well, it is. And it blooms dependably every year. So, I thought I'd share it with you. I very much like it when the plants which are among my favorites decide to bloom. That's the case with Rebutia heliosa. The plant itself is outstanding all year, but when it flowers...it's a stunner! I lot of time during the next week will be preparing for the first summer sale for the Oregon Cactus & Succulent Society. Nevertheless, I'll try to squeeze in a few photos along the way. 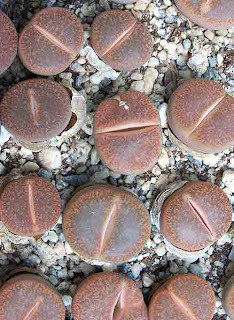 Time for the next batch of Lithops, this time Lithops lesliei minor 'Witblom' C006a. These are two-three year old plants which will exhibit their white flowers, along with most of the other Lithops, this fall. In the meantime the leaves will have a chance to grow a bit larger during our moderately warm summer. And speaking of weather, we finally had our first day which reached into the 80s F on Saturday. Today we were in the low 70sF and will probably be back into the 60sF by Monday. That's Oregon for you. And speaking of Oregon, if you're in the Portland, Oregon area on the third weekend of June, come on out to the first of two Summer Sales sponsored by the Oregon Cactus & Succulent Society. This ones at Portland Nursery, 9000 SE Division St. in Portland. Hope to see you there. Another of the Kelly Griffin hybrids, Aloe 'Orange Marmalade'. With brighter summer sun there's less green and even more orange. The number of Kelly Griffin hybrids must be massive and the many Aloe cultivars are quite the rage. It can't be denied that they're outstanding. This one is Aloe 'Diego'. I'll post a few others in the next week for your enjoyment. From our patio area comes this pot of Sempervivum 'Oddity', in the midst of a planting of Sedum reflexum 'Angelina'. The oddity was developed by succulent enthusiast Sandy McPherson way back in 1977. It promptly won the 1978 Bronze Rosette Award for best new variety and is widely available today. 'Angelina is certainly showy and very useful in landscaping, but can take over if not used judiciously. One of the new groups of Lithops we're adding to our offerings at the nursery, Lithops lesliei ssp. lesliei var. lesliei 'Albiflora' C005A. Obviously, it's the white flowered form. 'Fantastic' is a wonderful new cultivar discovered and introduced by Dave Fell of Hawaiian Sunshine Nursery in 2009. It's received many awards and is becoming widely distributed, often under the incorrect name K. thyrsiflora 'Fantastic'. This is a closeup of a plant we obtained from San Marcos Growers in California.